The group accommodation Fortuna is situated in the centre of the little Valais mountain village of Saas-Balen (Valais, Switzerland), only 100 metres from the bus stop, and offers its own car park. The house is partitioned into 15 double rooms; three rooms each share a bath/WC and a separate WC, partly with shower. Several living-rooms. The house also has a sauna. On the ground floor, you will find a large gastronomy kitchen, equipped with all the comfort you need. Next to it, a large modern day room with satellite TV. Moreover, there is a ski room, a playroom with several games and a common room with seating corner (1 sofa and 2 armchairs) and a cellar upon request. The large sports an playing ground of the village can also be used free of charge. The houses Fortuna, Siesta and Waldrand are only 200 metres apart and therefore enjoy the same local infrastructure. 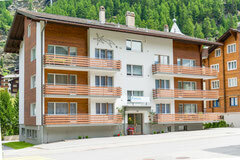 The canton Valais imposes high standards on camps with children and adolescents and on group accommodation. Please ask the landlord to show you his authorisation for the accommodation of youth groups before you make the booking. The house is rented to one single group at a time only.